Australian and New Zealand Academy of Management Founded in 1985 to advance management education, research, and practice in Australia, New Zealand, and beyond. ANZAM 2019 Conference – Call for Papers NOW OPEN!! 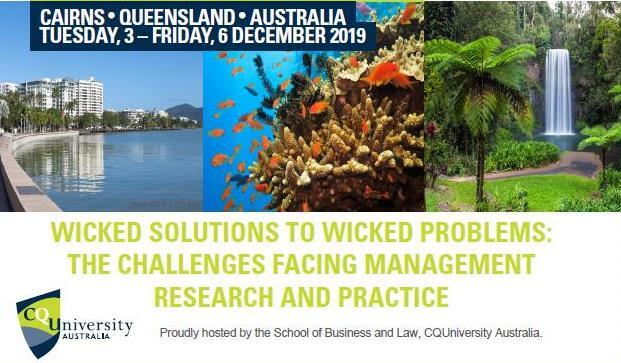 The ANZAM 2019 Conference will be held in Cairns, Australia, from the evening of 3 December until 6 December 2019, hosted by CQUniversity. The Conference theme is Wicked solutions to wicked problems: The challenges facing management research and practice. We are delighted to announce that the Conference website, including the Call for Papers, is now open. The closing date for… Continue Reading. ANZAM and the British Academy of Management (BAM) are excited to officially launch the ANZAM/BAM Collaborative Research Award. The purpose of this award is to support and advance international collaborations between management researchers in Australia, New Zealand, and the UK. The scheme gives priority for the development of ANZAM/BAM members who are at an early stage in their careers, defined… Continue Reading. As foreshadowed at the 2018 AGM, ANZAM and the British Academy of Management (BAM) wish to announce an inaugural joint Grant Scheme to promote research collaboration between our scholars. If you don’t have any research contacts who are BAM members, you will be able to send BAM a short (50 -100 words) note outlining your area of interest and contact… Continue Reading. We are delighted to announce the winners of the Stream Paper Awards for 2018. Click HERE for all the details. Congratulations to all!